After spending two months in Chiang Mai, I had experienced the the festival that I went there to see, spent Christmas and the New Year there, and had reached the end of my sixty day visa. I had two choices; do a visa run to stay longer (“Thai officials hate this one neat trick!”), or move on. I chose to move on. 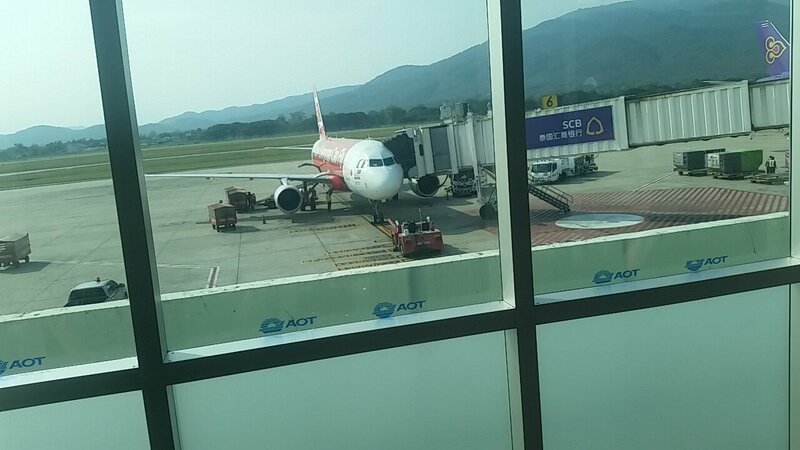 My plane at Chiang Mai Aiport. The rain was lashing my plane as I landed in Kuala Lumpur at 8PM. I don’t know if you’ve ever been in a plane during a tropical thunderstorm, but it’s fairly exciting stuff. The turbulence made the plane feel like a rollercoaster as your stomach lurches all over the place, bright flashes from lightning illuminate the unlit cabin, and the relentless rain looks like some kind of malignant spirit streaming across the plexiglass window. Visibility was low due the darkness, and the thick cloud layer; I was content to watch the water run across the window. I have many ways to describe the rain on my window; it was dozens of pixel-thin white angel-hairs fading in and out of view; it was thin strands of gossamer from hundreds of delicate spiders clinging on somewhere out of view; it was an army of ghosts rushing upwards to meet us as we descended from the heavens back down to the earth below. I had really enjoyed working out with Daniel during our month and a half together in Chiang Mai. He had flown to Kuala Lumpur at the start of January and wanted to stay a while, so I made KL my next destination too. This would work for both of us, as accommodation is relatively expensive here but we could make things cheaper by splitting the bill of a two-bedroom apartment. He was renting an airbnb apartment in Nadi Bangsar that would last for my arrival night, so I didn’t have to worry about finding a place to stay. After landing at Kuala Lumpur International Airport, I passed through immigration in minutes. I’m lucky to be a UK citizen, as I get a 90-day free visa without having to do anything. “Did you come from Chiang Mai?” “Yes.” “Where are you going next?” “I haven’t decided yet.” “Okay, thank you sir. Scan your fingerprints, please.” STAMP. I then briefly navigated through arrivals, taking out some Ringgit, picking up a tourist SIM so that I could use the internet to tell Daniel I had arrived, and bought a train ticket to KL Sentral, where I would meet Daniel. The train to KL Sentral was incredibly fast and remarkably smooth - the train has a top speed of 160km/h (99 mph). Meeting up with Daniel was straightforward. KL Sentral also includes a food court - they had a whole kiosk selling different varieties of vegetarian food! - and we ate there briefly before taking the train to the station that was a short walk from the Nadi Bangsar residence. The storm had passed by now, but the ground was still a little slippery. Nadi Bangsar is incredibly swanky and I’m glad I first got to see it at night. 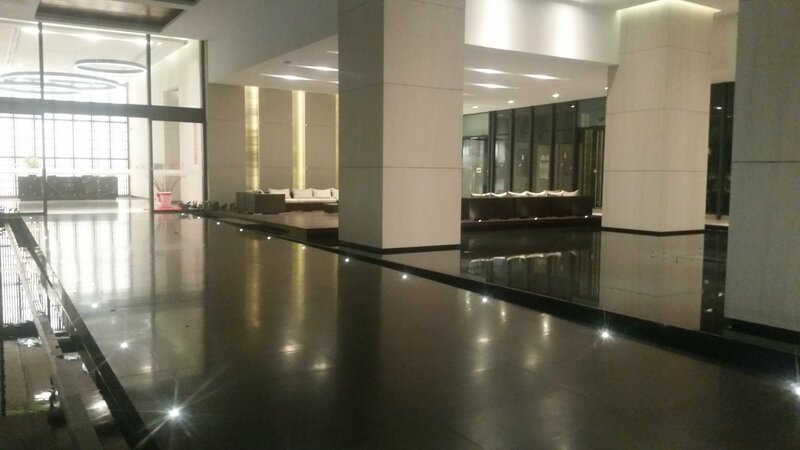 The entrance feels like somewhere Bruce Wayne might visit - polished black flooring with recessed pools flowing over on each side, little spotlights for mood lighting, and a relaxed set of modern furniture to one side. The entrance to Nadi Bangsar. 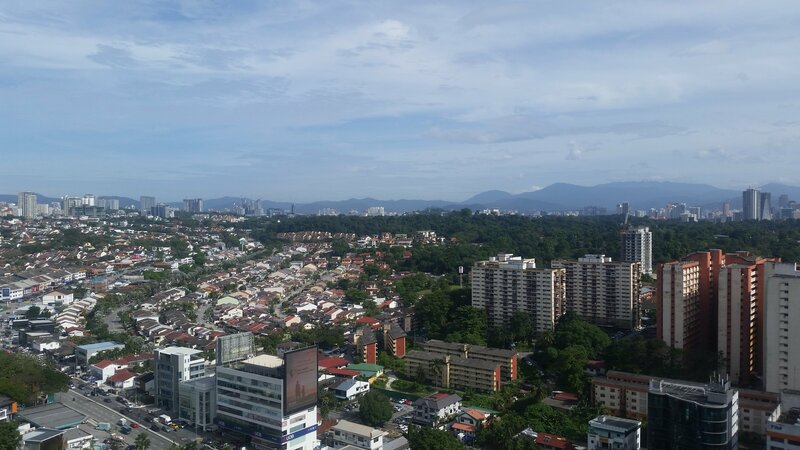 The view from Nadi Bangsar. One bedroom - Daniel’s - was furnished in modern looking grey colours with polygonal textures - it reminded me of Wilson Fisk’s apartment in Netflix’s Daredevil - whilst the other - mine by default - was furnished with pink floral wallpaper, pink sheets, and a pink chaise longue. A bed is a bed, and this once was particularly soft. The other thing the apartment had was a washer/dryer. After three months of hand-washing and wringing out my clothes (and having the calloused hands and friction burns to prove it), I was only too happy to use it. My micro-fibre towel had developed a slight smell of mildew that I just couldn’t get out, and my socks (despite only owning them for a couple of weeks) didn’t smell as fresh as they once had. I took the opportunity, and washed everything. Everything, including the clothes on my back. I walked around this fancy apartment wrapped in a towel and reflected that that is exactly how successful men are portrayed in films. I thought to myself - this is the kind of apartment where people grow soft. Comfortable. I went to my room and did pushups and situps to stave off that feeling. Later, I waited for my clothes to dry and went to the 7/Eleven to buy supplies and a toothbrush, and went to sleep whilst staring at the city through my window. If you haven’t already realised this from my previous writings about my travels, I like walking around a city when I first get here. I feel like it gives a feel for the city that you wouldn’t get if you just went from urban centres to urban centres with public or private transportation. 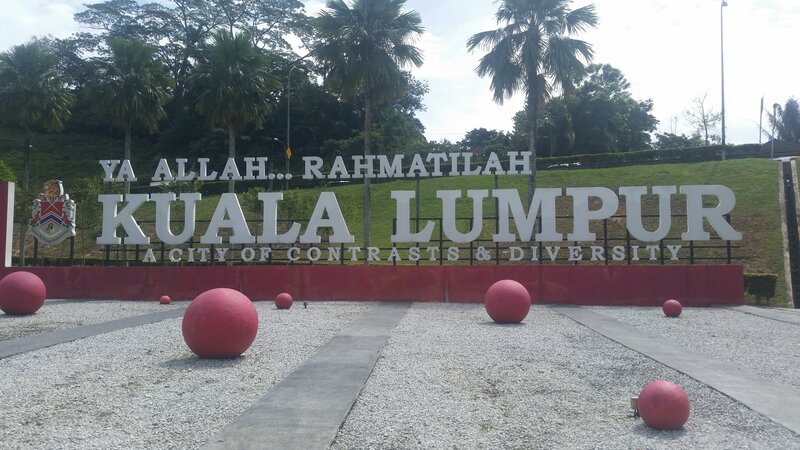 I wanted to walk around Kuala Lumpur, visit a few parks and landmarks, and maybe eat at a mall or two. So I set out to do that. 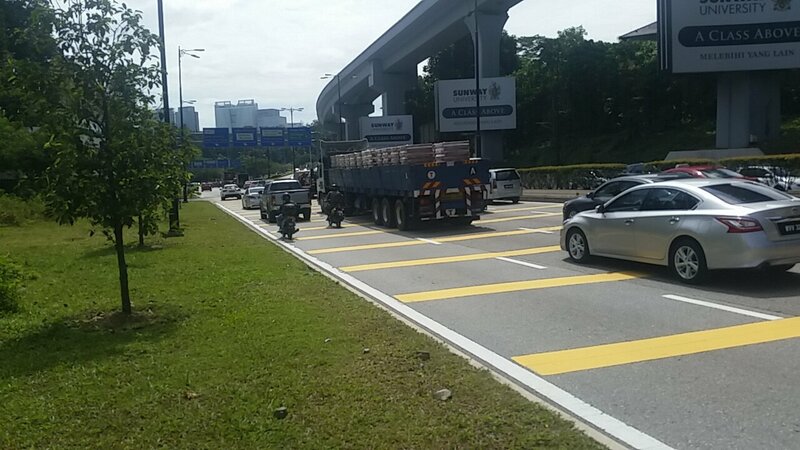 Given that I’m writing this post after the fact, I can now safely tell you that I think Kuala Lumpur hates pedestrians. Not only do they have a jaywalking law, but outside of the 2km-radius city centre, the city is just little clumps of civilisation connected only by motorways, which are impossible to cross as there are no bridges or tunnels. I didn’t know this when I set out on the morning of my first day. 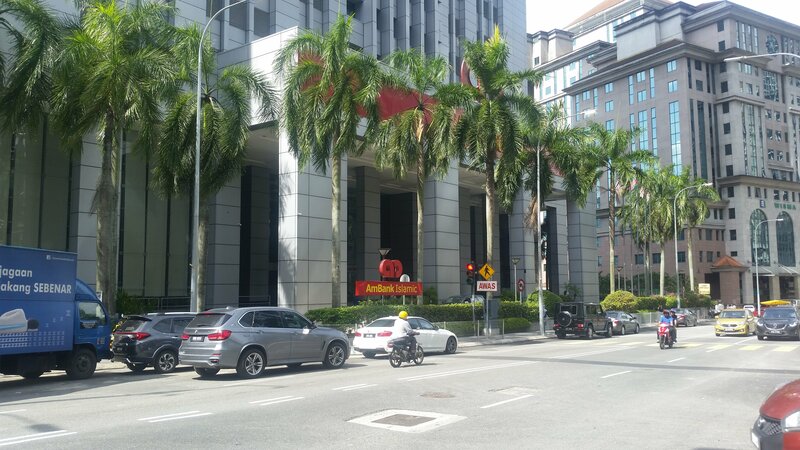 I set off to try to visit the Perdana Botanical Gardens and the nearby bird park and butterfly park. 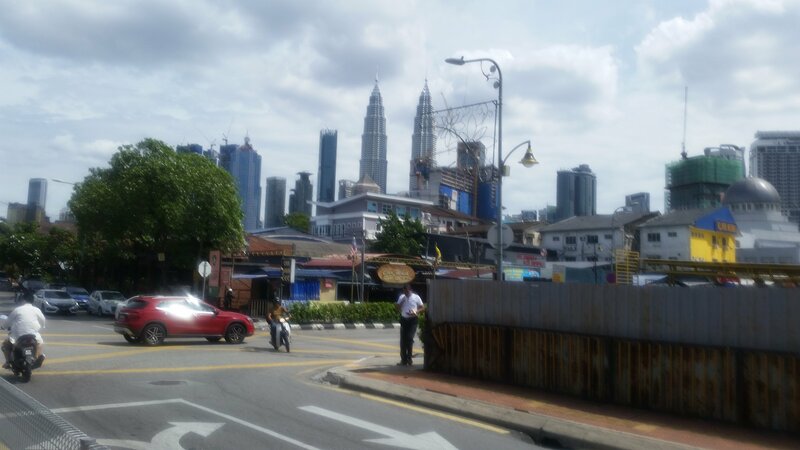 After that I hoped to explore the city centre and visit the Petronas Towers. 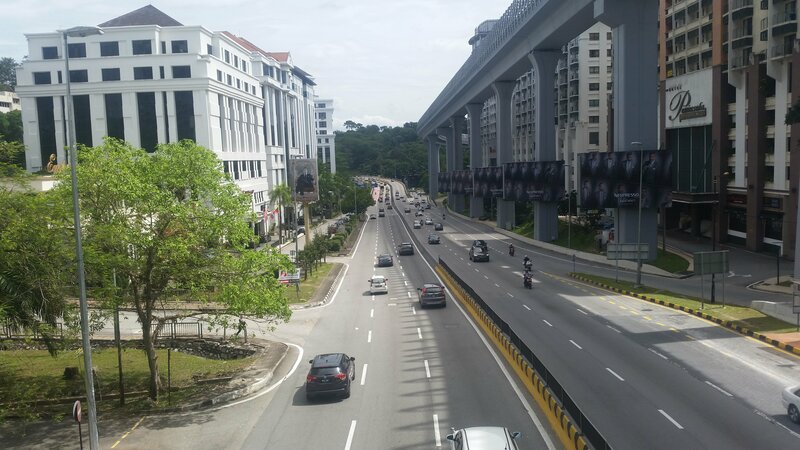 I passed by the Jalan Bangsar Station and quickly found myself walking along a motorway. I followed it for a while, and hoping to find a reprieve or exit. I really don’t like walking along the motorway, and the first destinations that I was hoping to hit were on the other side of it. I eventually ended up in Bukit Persekutuan, a very low density residential area atop a hill, surrounded by jungle-ish forest. I wandered around in these hills for a while - it was steep and felt relatively wild. I found it hard to tell exactly where I was as my GPS was jumping around - I realise after the fact that sometimes it was up to 500m off! Traffic in the hills was limited, but what little I did see was moving very fast and it felt dangerous to be walking here. Eventually I decided to backtrack and go back to the motorway, where more often than not there was an embankment I could walk along. I ended up just 200m further ahead after my detour to these hills. After walking for almost two hours, I could feel the sun on my neck, arms, and legs burning, and (as embarassing as it is) I desperately needed to poop; in fact, my need to defecate was so bad that every time I stopped moving to take a photograph, I’d feel this sharp pain emanate from my gut into my legs when I started to walk again. And I’m still stuck along the side of a motorway with no end in sight. Needless to say, I found a secluded area down an embankment off to one side to do my business in. I cleaned up using a banana-tree leaf and was reminded of a great moment in the amazing How To Run 100 Miles documentary. Finally I saw civilization and buildings in the form of Sunway Putra Mall. My first stop was the bathroom to clean up more properly. I spend probably five minutes washing and rewashing my hands, before going into the stall at the far end to clean up elsewhere. But oh no! It’s a squat toilet with a fixed-position bidet rather than a hose or toilet paper. Picture the scene: I’m crouching there with my shorts around my ankles. I turn the faucet on, and it sprays way too far, goes through the gap between my legs and splashes under the toilet door. I reposition and try again and the force of the jet of water is much less so it drenches my shorts this time. Can you imagine how frustrating that was? The third time was more successful, but it still wasn’t a very pleasant an experience. Worse was when I left my cubicle and saw that the other three cubicles, all now unoccupied, contained regular toilets. Damn. I wandered around the mall; I could see all kinds of restaurants, but I couldn’t see a proper food court. Instead, I went to a Cold Storage supermarket to get a drink and some snacks. 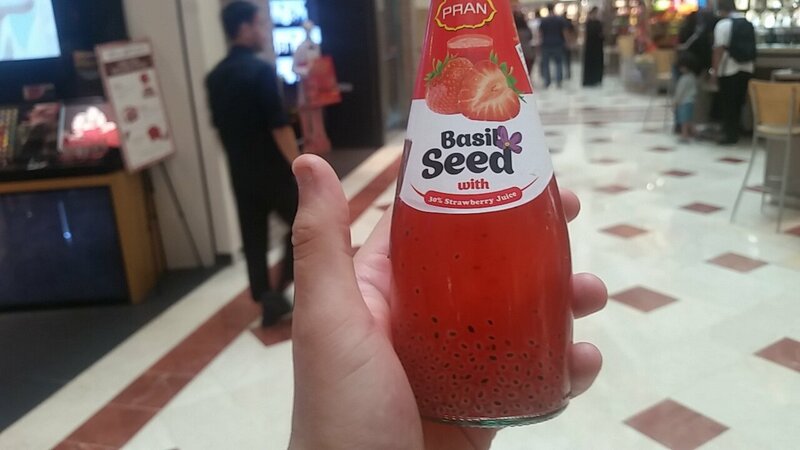 I saw a ‘Basil Seed’ drink which was like nothing I had every witnessed. A small glass bottle full of liquid with hundreds of tiny gelatinous seeds floating inside. It came in four flavours; Kiwi, Lychee, Mango, and Strawberry. I first tried Lychee and I loved it. It was fun to play with the seeds in my mouth, though that sounds weird now that I write it. Supposedly those seeds are really good for you too. From here, my journey was a lot more pleasant as I was in the city centre, which is a lot more pedestrian friendly. 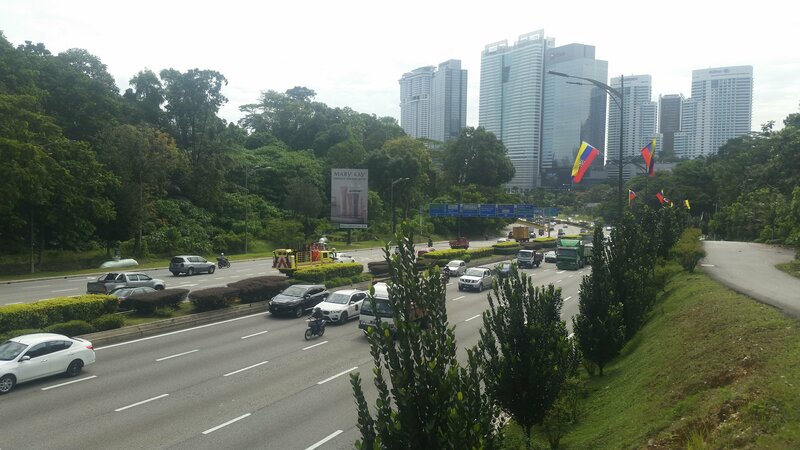 I enjoyed my walk a lot more once I got to Kuala Lumpur City Centre (referred to as KLCC) and it’s outskirts. Being in the shade helped. It was also a lot easier to navigate. 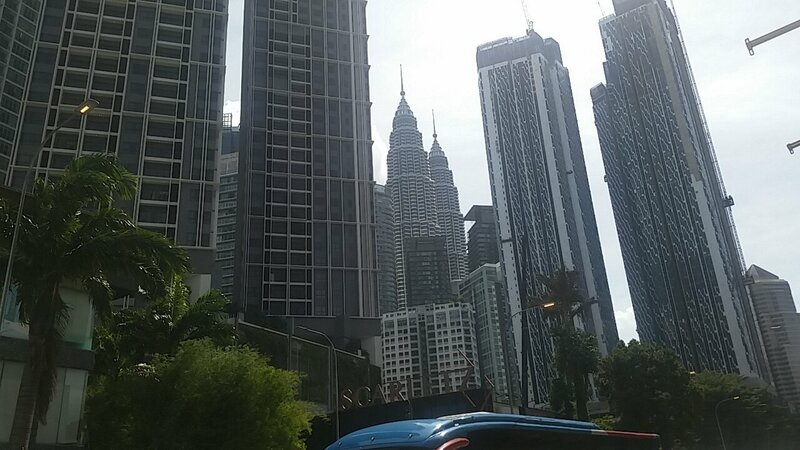 I used the Petronas Towers as my landmark and headed towards them in a roundabout route. 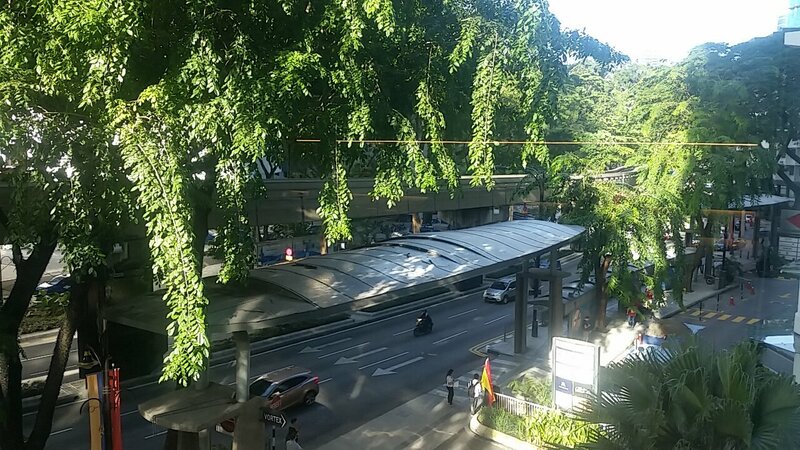 Again, I found myself frustrated with the pedestrian access - for instance, the Chow Kit Monorail Station seemed like it might also serve as a pedestrian crossing for the busy intersection below. In Bangkok, every rail station I encountered could also be used for a pedestrian crossing. After climbing the stairs, I found that whilst the station indeed had stairs up and down on either side, you couldn’t cross over as there were the ticket barriers in the way. If they had just repositioned where they installed them, they could have installed half as many barriers, half as many ticket booths, and allow for pedestrian crossing. Annoying! Whilst I wandered around, Daniel was trying to communicate with me to figure out where to live, but it was kind of hard to have the discussion online. We decided to meet at Suria KLCC, get some food and talk it out. Getting there wasn’t hard. Suria KLCC is at the base of the Petronas Towers - as I write this, the Petronas towers - once the tallest in the world - are tied-sixteenth tallest. Needless to say, Suria KLCC has some pretty convenient landmarks to navigate towards - you don’t even need to consult a map! The Petronas Towers from afar. I’d been walking for several hours in 33C weather and direct sunlight by now, so I took the opportunity to sit in the cool, air conditioned mall whilst I waited for Daniel to arrive. 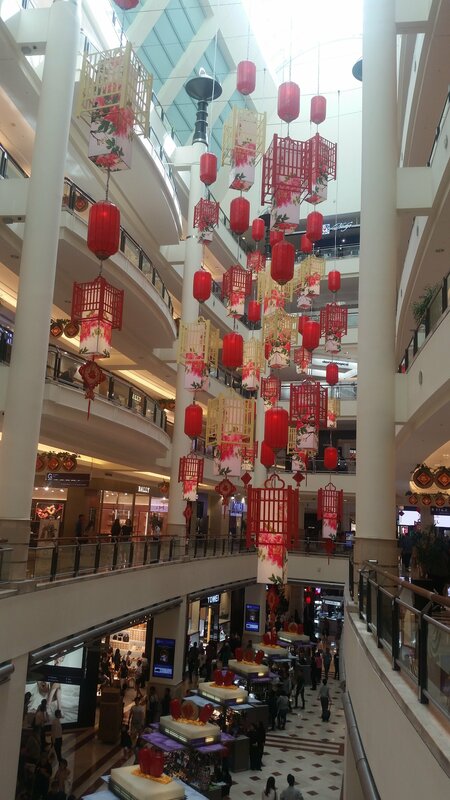 Suria KLCC is decorated with lots of red lanterns in preparation for Chinese New Year, which is in two weeks at the time of writing. 25% of the population of Malaysia are Chinese, so it’s quite a big deal! When Dan got here, I took him to the Suria KLCC’s Cold Storage and bought him some more of those basil seed drinks, which he liked too. We found our way to the food court - there were two stalls which sold exclusively vegetarian food - and ate whilst looking at apartments on Airbnb. Daniel picked some good candidates but I found problems with almost all of them. Actually, the best candidate was also the first one he showed me, and we decided to book it right then and there. Unfortunately, we couldn’t check in until the next day, so we had to look for a hostel or a hotel to check into. 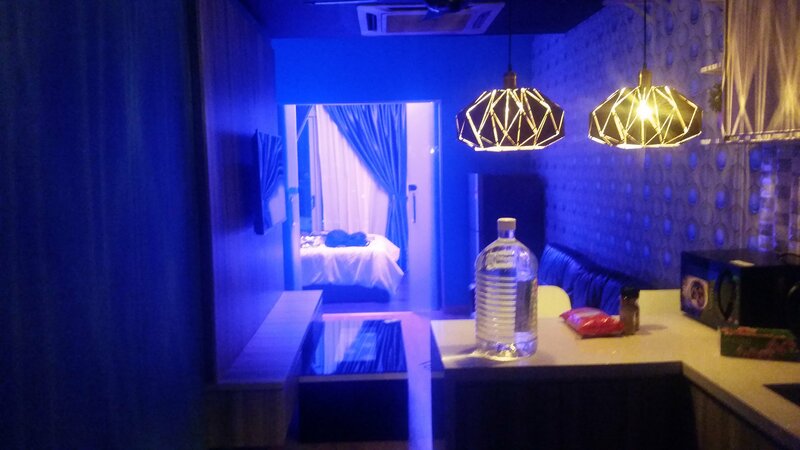 We quickly picked to stay in The Bed, a capsule hotel in the heart of Kuala Lumpur. We checked in after walking there and were pretty wowed by the place. 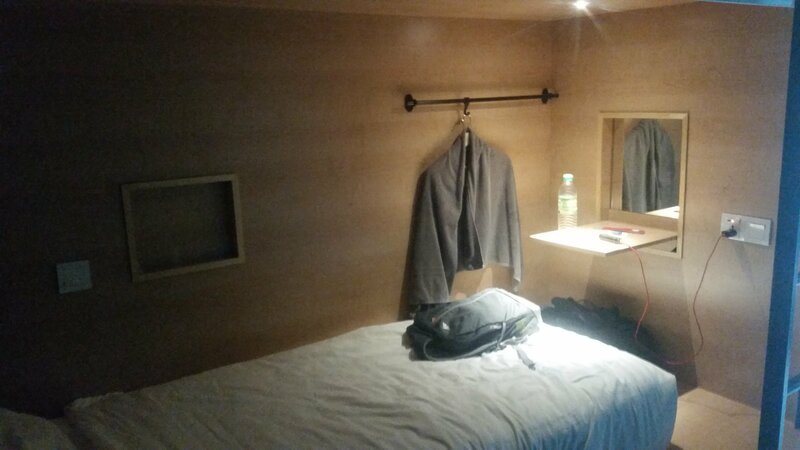 I’ve stayed in capsule hotel-like places before - Bed Ford hostel in Chiang Mai was fairly similar to a capsule hotel - but I think it was a first time for Daniel and regardless we were both impressed. They give free breakfast, slippers, toothbrush and toothpaste, and they give you a towel to borrow. Everything was very clean and very modern. The keycard locking system for the doors was one of the most painless of any hostel I have stayed in. For now, we just dropped off our things and showered. Each capsule has a fairly generous locker, so it was trivial to store our things. We were already pretty hungry again, so this time we went to Pavilion Shopping Mall. Again, we were able to find a food court in the basement. Again, I was able to find a kiosk which served exclusively vegetarian food. This one served all kinds of ‘Vegetarian Fish’ and ‘Vegetarian Chicken’ and so on, made from soya beans. I ordered some kind of spicy noodles and a side of spring rolls and vegetarian fish pieces. It was a very interesting meal, and I was definitely eating things with textures and consistencies that I was not familiar with. There were white balls with the consistency of mushrooms-crossed-with-mozzarella, red shapes that might have been something like flavoured paneer, and mysterious vegetables. I recognised slices of Konjac corm from my time eating at Shan Tou Hao Chi, so maybe I will be come more familiar with some of these ingredients as I go. This dining experience felt like one of the first times in my travels where I had been truly adventurous with my eating. Dan felt the same about his meal, and I think we could both say with confidence that we had no idea what we had been eating. After eating at Pavilion, it was close to 10PM and most things were closing. We went back to The Bed and turned in for the night. 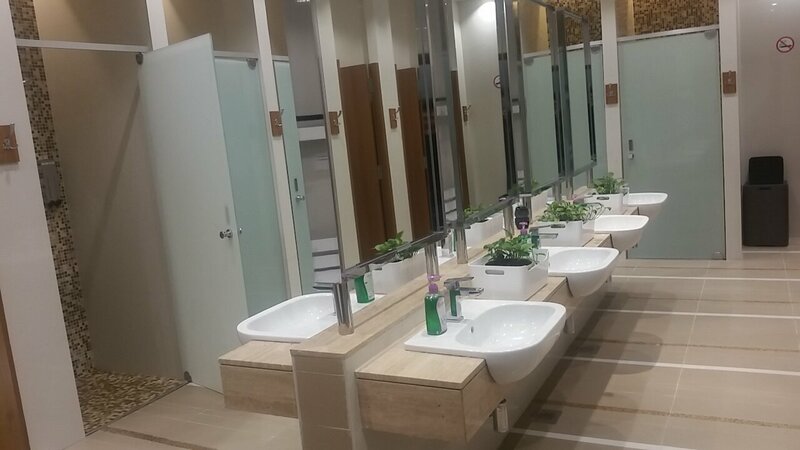 The bathroom is very smart and clean, which is refreshing for a hostel, and the free toothpaste was tasty and felt fresh. The bathrooms at The Bed. Our beds are in the form of side-entry pods - twenty to a room in ten separate sets. My pod is up a ladder whilst Daniel’s pod is on the ground. The pods come equipped with a small mirror stroke fold-out table, power sockets (and UK plugs for once! ), a USB-port for charging, lighting, and a very comfortable bed. There is a privacy blind that you can pull down, and it has some kind of ‘magic-mirror’ like property where I can see out but nobody can see in - at least until I turn the lights on. The room is air-conditioned to a pleasant temperature and I quickly drift off to sleep. Dan’s sleeping pod at The Bed. I awoke pretty early in the morning for me, at 8AM. I checked Telegram and saw that Daniel had been active an hour and a bit before I woke up. I couldn’t tell if he was in his pod, but I didn’t see any movement or recognition of my presence, so I assumed he would be in the common room eating breakfast (which is served until 10AM) or using his laptop or something. I didn’t see him there either, so proceeded to start eating breakfast. View from The Bed’s common room. 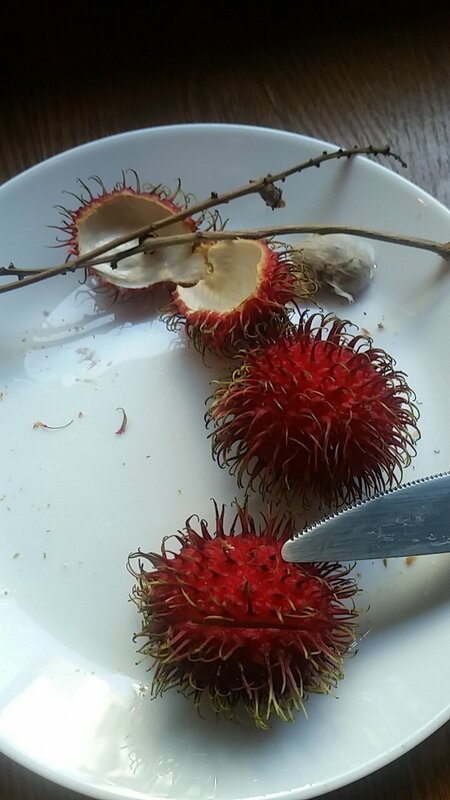 I sat looking out of the window with my four slices of toast with strawberry jam, and ate a few Rambutan, a fruit I had never tried before but which is similar to Lychee. At one point, a wide-eyed asian girl asked me how to use the Toaster, so I guess she must have been feeling some kind of culture shock too. Rambutan, a lychee-like fruit native to Malaysia and Indonesia. At 9AM, I heard from Dan, who had apparently been sleeping the whole time. I showered and went to the common room to write the first few paragraphs of this entry. At 11:20AM, I went back to my room, packed my bag, did a quick workout, and left at 11:55AM. We had two hours to kill before we could move into the apartment, so we went back to Suria KLCC, where I ordered from the other vegetarian kiosk that I hadn’t tried yet (whilst Daniel got exactly the same meal, shame on him!). I had Indian food, and I really appreciated it because I haven’t had any since I left England. Daniel and I chatted about our time in High School together whilst we ate, and it was a little depressing to realised how much each of us had forgotten as we reminded each other of different events and people. It made me wonder how much I was still forgetting. I felt grateful that I am recording some of this current travel portion of my life here, for I am sure I will forget much of it. After eating, we got some more basil seed drinks from Cold Storage as well as some Kettle Chips that we both like, and went and sat in the KLCC park. The sun was blazing by now as it was 1:15PM and there wasn’t much shade to speak of. We initially sat in light shade under a small tree at the north side, but we could feel our skin burning, which really wasn’t good for me as I already had the makings of sunburn from my walk the day before. We moved across to the other side of the lake, where we could watch the water feature, and where occasionally a light breeze would hit the water feature and a light mist would wash over us. At 1:28PM, the Muslim call to prayer was given. It was my first one I had been able to hear since I arrived, and we looked on Google to see what exactly it meant. Malaysia is a majority Muslim country, and by this point I was fairly used to seeing around 50% of women wearing headscarves, but I still found the call to prayer to be interesting. I didn’t see anyone react to it - most people sitting in the park continued to sit, so I’m not really sure what that means. By 2PM, we needed to go and move into our apartment, so we took a Grab to the place. The driver was very chatty, and went on about how the sun isn’t very harsh here, which I find to be incredulous given that we’re right next to the Equator and given that it took me only a day to develop the beginnings of sun burn. After getting dropped off, Daniel called the airbnb host, who sent his Son to give up the keycards and let us in. The apartment was actually nicer than the airbnb listing made it seem. It’s expensive compared to other places I have stayed (£349/mo each), and a little small, but it is furnished very nicely. We have air-conditioning in both bedrooms, comfortable beds, a sofa and TV, a small kitchen area with a kettle, hotplate, and microwave, a shower-room, and a toilet. My room has a wardrobe, a small desk, a small balcony, and two bedside tables. Daniel’s room has similar, but he has a window instead of the balcony, and more floor space to make up for that deficit. The feature light in my bedroom. My favourite thing about the apartment is the lighting. There are regular lightbulbs, but then each room has a special ‘feature light’. Mine lets me colour my room a neon-purple, a warm-yellow, or a sterile-white. My bedroom is connected to the rest of the apartment with sliding glass doors, which really accentuates the lighting. 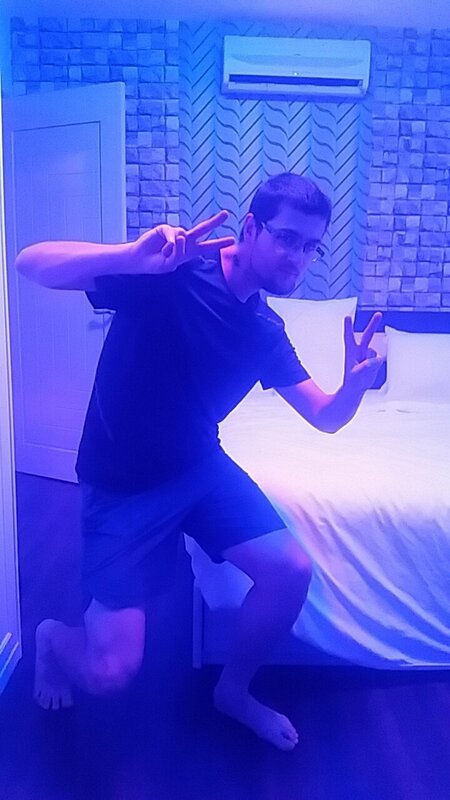 Dan’s room has a light which colours the room a neon blue, and the same yellow and white tones. The kitchen has a pair of hanging lights which project a marbled orange colour across the space. 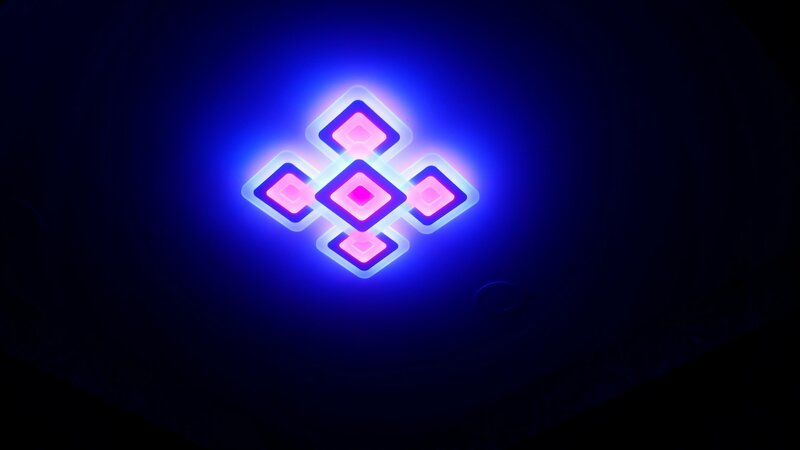 When everything is turned on, it feels light a nightclub, and it’s pretty awesome. 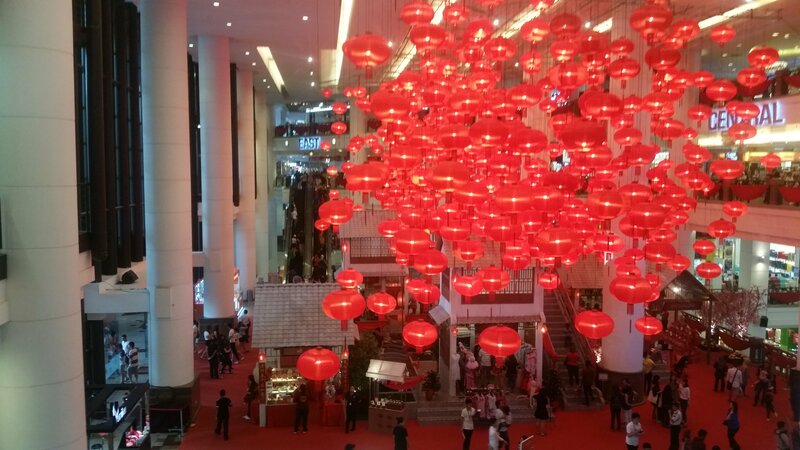 Next door to our apartment is another mall, this one is called Times Square, and again it has beautiful Chinese New Year decorations. There’s a food court here called ‘Taste Of Asia’, which has all different kinds of Asian cuisine. We both got Indian food, which had fairly generous portion sizes for just 8.5 Ringgit (£1.60, €1.82, $2.08). I got two portions - a kind of spinach stew, and a set of potato and cauliflower curry. Both were served with a big block of rice, a pappadum, and a small bowl of tasty daal. 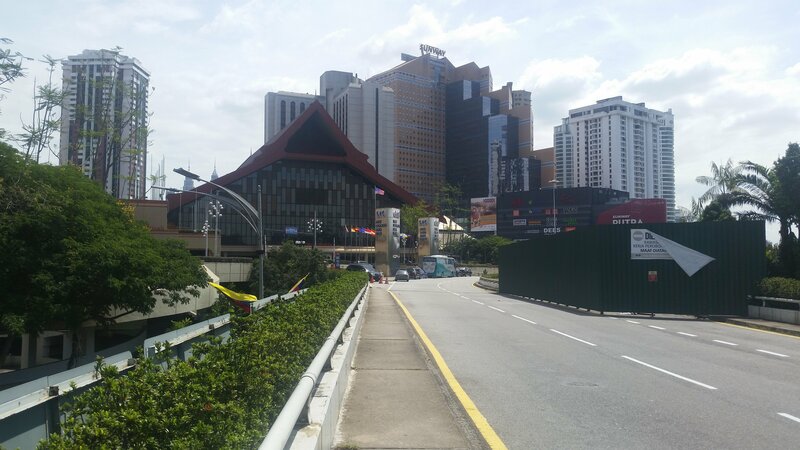 I have a good feeling about Malaysia - every mall I have visited has had vegetarian stalls, and generally I like the feel for the city, even if it is hostile to pedestrians. I think Kuala Lumpur feels like what I had expected Bangkok to feel like - pockets of developed spaces with less developed, rougher areas between. I like it! It’s a good feeling. It might be more expensive than somewhere like Chiang Mai, but you can’t expect everywhere to be so cheap. It’s still much cheaper than living a similar lifestyle in the United Kingdom.